Happy Thursday!! 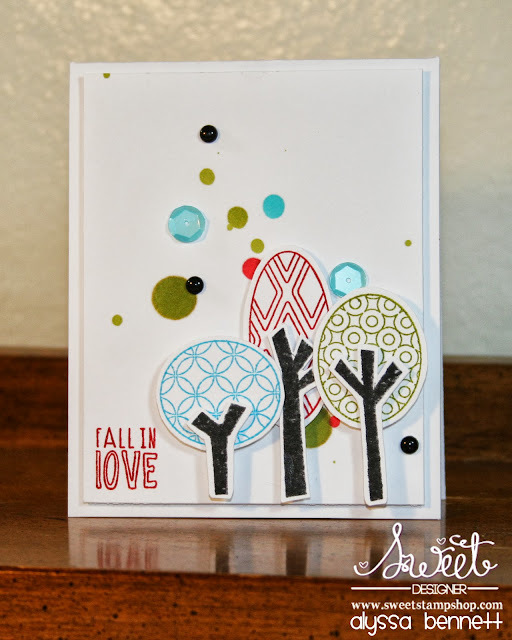 I'm on the Sweet Stamp Shop Blog again with another Triple Sweet Thursday - 3 Cards, 3 Ways, 1 Challenge! Once again I'll be spotlighting ONE challenge and rocking it THREE ways to get you inspired! 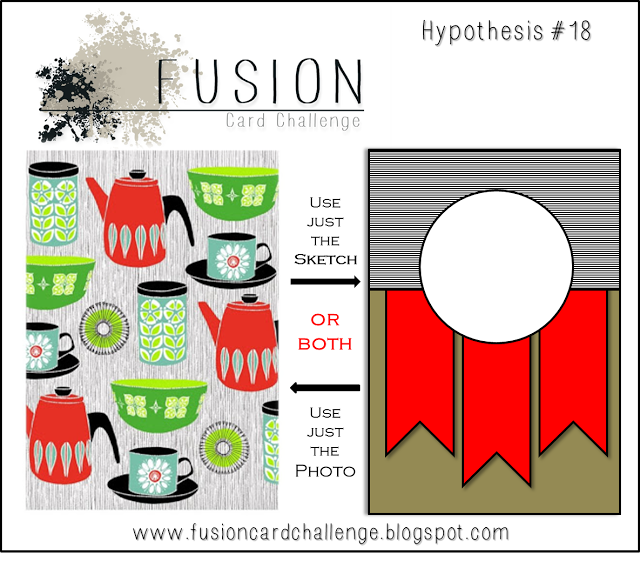 Fusion Card Challenge offers a new challenge every other week in which you are provided with BOTH an inspiration image AND a card sketch. You use JUST the image, JUST the sketch, or BOTH. Once the entry period has ended all of the entries are opened up to voting. The entry that receives the most votes is declared the Zen Master and 3 Honorable Mentions are also chosen. OPTIONS. This challenge is basically TWO challenges in one: and inspiring image AND a sketch, PLUS the added option of combining the two. I LOVE options when it comes to challenges, the more inspiration the better, and Fusion Card Challenge really delivers. Another thing I love is that this challenge offers the chance for our peers to VOTE. Most challenges seem to be random or judged by a design team, Fusion is more of a people's choice. And don't we all just LOVE to have a say and get a VOTE these days? I just LOVED this funky inspiration photo (which just happened to include my two favorite colors: teal and green! ), and who doesn't love a classic sketch with banners?? For this first card I decided to pull inspiration from the photo ONLY. I chose to use the colors mostly, but I also pulled from some of the shapes on the cups which is what pulled me to use the trees from the Sweet Stamp Shop Fall Gratitude stamp set. The "Fall in Love" sentiment is also from this set. For this next card I decided to focus on the sketch ONLY. 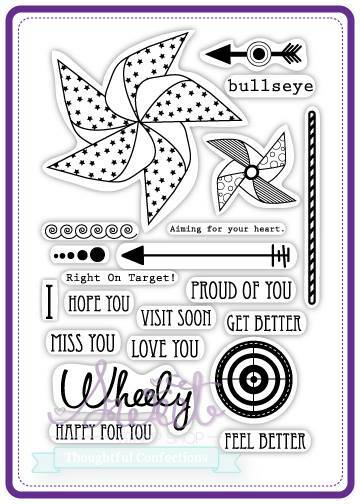 I turned the sketch on it's side and used the bullseye from the Sweet Stamp Shop Wheely Like You stamp set as my circle. In place of two of the banners I used arrows (one from Wheely Like You and the other from Made By #2). The sentiment is also from Wheely Like You. Instead of using a patterned paper I decided to create a similar effect with watercolor. For this final card I decided to combine the inspiration photo AND the sketch. All of the stamps you see here are from the Sweet Stamp Shop Chalkboard Sign set. Once again I turned the sketch on it's side. I stamped the hearts in the colors I pulled from the inspiration photo. In place of the main circle I used my "I Love You" sentiment, and in place of the banners I used arrows. Don't you just LOVE the OPTIONS?? I'm looking for MORE challenges to feature right here on the SSS blog! What is YOUR favorite challenge to play along with? Leave me a comment and let me know! If you were to enter this Fusion challenge which route would you take? Inspiration photo, sketch, or both?? Have you checked out the SSS Pinterest and Flickr pages? There's TONS more fantastic inspiration on those pages so be sure to click and check them out!! And before I go I just want to say that Sweet Stamp Shop has some REALLY exciting things around the corner, so be on the lookout for the next release, I know you're going to LOVE it! 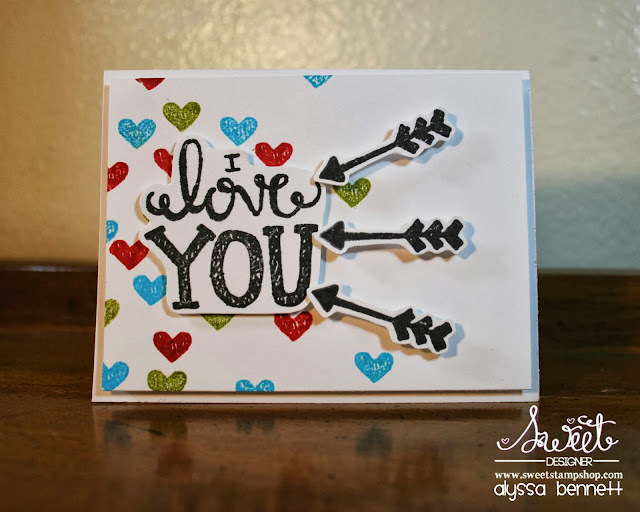 Alyssa, I love the cards you've created! Wow! You knocked the challenge out of the park, three gorgeous CAS designs and three amazing results. I love that you played along with us at Fusion not once but three times! I love your gorgeous cards. Wow, Allysa! 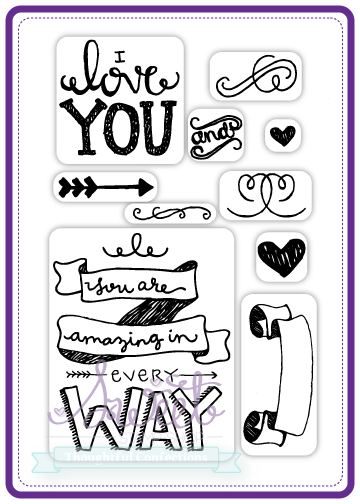 LOVE EVERY one of these trendy cards of yours! They're all so different and ALL awesome! Sure do appreciate you taking some time to spread the good word about FUSION, too...so happy you're enjoying it, and DEE-lighted to have you with us!